As Edmonton Economic Development’s (EEDC) newest division, the Edmonton EXPO Centre is inviting guests and clients to experience more! The venue is a powerful economic catalyst, providing authentic experiences and limitless opportunities in the most imaginative event space in Canada. Built in 1983 and expanded in 2009, there isn’t an experience that western Canada’s largest trade, consumer and events venue hasn’t hosted. Now under the EEDC banner, the Edmonton EXPO Centre is even better positioned to work collaboratively with its sister divisions, the Edmonton Convention Centre and Edmonton Tourism, to attract and host amazing large-scale event experiences that generate significant economic activity and impact for our city. Through trade and consumer shows, concerts and festivals, national sporting events, conferences, business meetings and celebrations of every kind, the venue welcomes more than 1.5 million guests annually and delivers more than $33 million in economic impact for our city. As the largest venue of its kind outside of Toronto, the Edmonton EXPO Centre team has a unique ability to adapt their space, both indoors and outdoors, into any configuration. This is why it is home to over 400 diverse events annually. With a vision to be one of North America’s top performing venues, planners help clients imagine events with fewer infrastructure barriers than other facilities. Featuring nine exterior access overhead doors and 11 large loading docks surrounded by 3,900 parking stalls and outdoor staging areas, the Edmonton EXPO Centre manages the biggest and the best shows in the event industry. Just ask the Edmonton RV Show team who bring over 500 recreational vehicles indoors every February, or consider the Edmonton Cottage Life and Cabin Show, where a full-sized cabin replica is erected inside to wow guests. The 600 luxury vehicles that fill up the venue for the prestigious Edmonton Motorshow every April is another stunning example of how Edmonton EXPO Centre clients can dream big, and trust that the venue and staff can deliver on the grandiose details every time. It takes a special kind of team to activate and operate in a space this size. The venue boasts a tight-knit and seasoned team with an unshakeable commitment to service excellence – more than 40 per cent of the staff have received awards for 10+ years of service. In May 2018, the EXPO Centre hosted Volleyball Canada Nationals, which was brought to Edmonton through close collaboration with EEDC’s Edmonton Tourism division. From junior matches between 14-18-year-olds, to international matches in men’s, women’s and sitting Volleyball, this event brought over 10,000 athletes and 12,000 spectators to the venue. Generating over $30 million in direct economic impact, a whopping 864 teams played 3,184 games on 55 sprawling volleyball courts throughout the entire venue. This event required expert coordination and communication among all departments, from parking and event operations to food and beverage and guest services. “Extraordinary things happen when the right team is in place,” says Arlindo Gomes, general manager of the Edmonton EXPO Centre. “We empower our employees to go above and beyond for our clients and guests to ensure every interaction they have with us is exceptional”. With a full-time contingent of 76 staff and over 600 part-time staff, the Edmonton EXPO Centre is a proud team of experienced facility operators, culinary service experts, event and guest services staff, security personnel, and sales and marketing professionals. This engaged and energetic team helps make the Edmonton EXPO Centre a preferred destination for unique events that drive commerce, build connections and networking opportunities, and create lifelong memories. 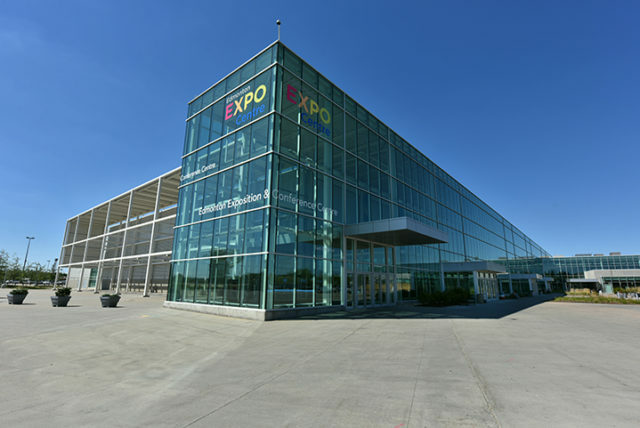 Owned by the City of Edmonton and managed by the Edmonton Economic Development Corporation, the Edmonton EXPO Centre has a mandate of providing economic and social benefits to the Edmonton region. Playing host to large scale events such as K-Days and Farm Fair International, the EXPO Centre demonstrates its value as a community asset by supporting the City of Edmonton’s long-term vision of regional prosperity and providing an environment to connect people and business. While the Edmonton EXPO Centre has deep roots in the community as a space to come together for amazing experiences, it also supports numerous charitable organizations and communities in Edmonton through in-kind support of equipment and resources. To ensure support has the greatest impact possible, community investment efforts are focused on initiatives related to the area’s neighbours and local youth initiatives. Some of the most recent partnerships include Special Olympics Alberta, Kaleido Family Arts Festival, Deep Freeze: A Byzantine Winter Festival, Parkdale and Cromdale community league events, the Junior Chamber International Edmonton Holiday Hamper Program, and YoungLeaders.World. • The Edmonton Expo Centre has a resident sports team! The Edmonton Stingers are part of Canada’s newest professional basketball league, the Canadian Elite Basketball League (CEBL). Starting in May, the venue will host 10 home games against teams from Fraser Valley, Guelph, Hamilton, Niagara and Saskatoon. • Executive Chef Jiju Paul has experience in five-star hotels across India, Canada and the United Arab Emirates, where he was part of the Emirates Culinary Guild and led the Fairmont Ajman Culinary team in international culinary competitions. • The Centre diverts 60 per cent of the waste generated at the venue. That’s over 620 tons of material avoiding the landfill each year though recycling and organics programs. • Hosted events like the Edmonton RV show provide a robust impact to our city, with $14 million in sales activity over one weekend and thousands of attendees. • The venue is a catalyst for commerce. Every year hundreds of Edmonton small businesses participate in the numerous tradeshows to promote and scale up their businesses. • Edmonton Expo Centre isn’t afraid to get dirty! Sixty tons of dirt was brought in for the PBR Edmonton Classic in October. Being host to 50 bucking bulls and 32 bull riders takes a crew of 30 people over 36 hours to set up. • Ice was created inside Hall D for the first time in 14 years in preparation of Disney On Ice presents Dare to Dream. Over 20,000 guests and a lot of happy princes and princesses took in 11 performances. • The venue hosted Her Majesty Queen Elizabeth II and His Royal Highness The Duke of Edinburgh in 2005 for the Alberta Centennial visit. Fast forward to 2018, and the venue played host to Princess Anne, the Princess Royal for the 28th Commonwealth Agriculture Conference.